The Come UP……V2 Al Fatir!!! I started The Come UP as a series of articles focusing on up and coming artists that have a strong sound. I typically don't write about commercially successful artists or albums because they already get enough exposure and my column on www.boywithstick.com is dedicated to digging up those artists that most people may not have heard of, but deserve attention too. With that being said, I think that Al Fatir is set up to succeed in hip hop on a commercial level. The lyrical skill/flow is at a level where recognition for his work is well deserved. I won't/can't write about an artist if I don't genuinely feel the work. I also don't write negative reviews, but I will refuse to write about an album if I'm not feeling it. I'm outspoken about things I don't like, but I am not in the business of bashing people's work for publication. 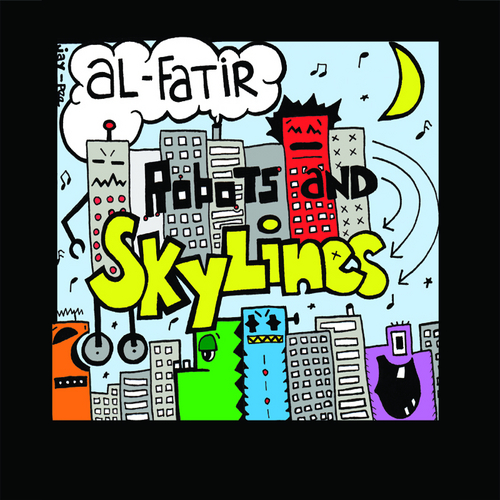 With a rude boy attitude, cocky disposition and cut throat intuition, Al Fatir dropped a well rounded mixtape called Robots and Skylines. Al Fatir is a Connecticut based rapper that made connections with the right producers to create a strong mixtape. Robots and Skylines has already received some buzz online, but it hasn't cracked the surface of it's potential yet. From what I gather, the title Robots and Skylines alludes to the future. While the album isn't a futuristic themed mixtape, there are other ways to use the future as a metaphor. I imagine that is where the title is heading, even if the album art doesn't match that 100%. This was my introduction to Al Fatir's music and overall, I walk away wondering how long it will take for other people to catch on since it only dropped in February. It's funny how a solid, signature track that can create a platform for competition. I'm not usually for that when it comes to classic albums, but when it comes to singles, hip hop has always been about remixes and competition. Hometown is one of those tracks that act as an open ended invitation for mc's to show their skill. Here's Al Fatir's take on it where he represents his underrepresented hometown. While there are tracks that focus on things that I generally stay away from, I know that these themes and concepts are common and popular in the rap world. So, I'm not here to judge. The tracks that I'm talking about are Boss Pimp Playa, Chasin' Payment and Moet Chandon. The album balances that out with tracks like Story, Hometown, Strong Connection, London and Freedom Town. The bases are covered with Robots and Skylines and you're basically guaranteed to find at least few tracks you can feel. Like I said before, the album features really strong production on all tracks, unique samples and while there are a few featured artists, Al Fatir voice and storytelling unify the project. You get a good idea of the versatility and his style of up or down tempo tracks, anthems, etc. If you go to the links below, you can listen to or download the full mixtape on Datpiff.com.